Why commercial real estate (CRE) debt now? 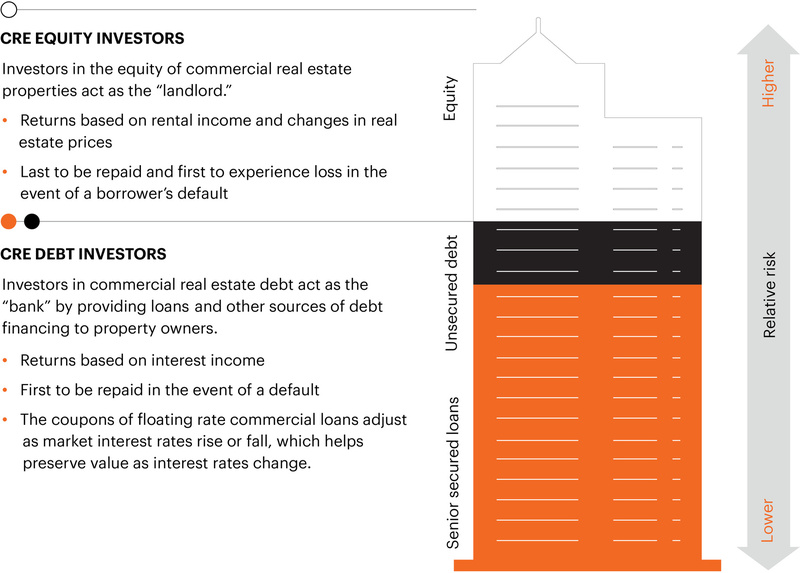 While investing in both the equity and debt of commercial real estate properties may provide investors with income, there are some key differences that investors should consider. An allocation to real estate, and more specifically commercial real estate, is a staple within the portfolios of many individuals seeking income and portfolio diversification. Investors have historically accessed this asset class through equity-based real estate investment trusts, or REITs. 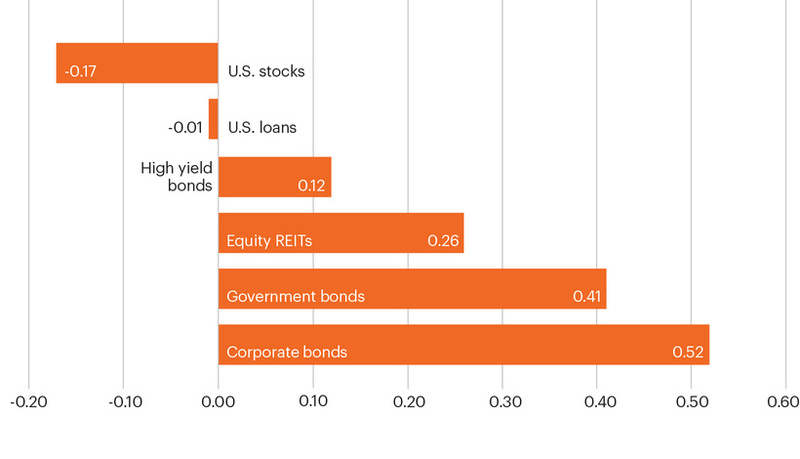 While equity REITs have generated higher returns than many other asset classes, they have exhibited significantly higher levels of volatility. By comparison, CRE debt, and specifically commercial mortgages, delivered approximately 66% of the returns of equity REITs with just 20% of the volatility. Past performance is not indicative of future results. The beginning time periods referenced are based on the availability of index data. The performance of traditional fixed income investments, such as corporate and government bonds, has been driven in part by favorable long-term macro trends, which may not be replicated in the coming years. 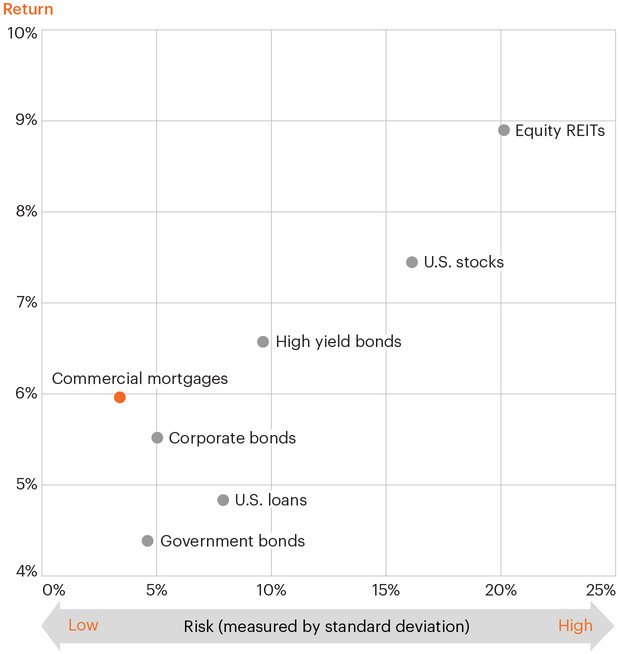 CRE debt has exhibited low correlation to major asset classes. 1 Federal Reserve Commercial/Multifamily Real Estate Mortgage Debt Outstanding, Q2 2018. 2 Wells Fargo Commercial Mortgage Outlook, as of January 9, 2017. 3 Data from 1/1/1998–12/31/2018. Represented by the Giliberto-Levy Commercial Mortgage Performance Index. The Giliberto-Levy Commercial Mortgage Performance Index measures the investment performance of select private-market investments in commercial real estate debt. Income return is the rate of return generated from any interest or dividends received on the investment. Average annual income return is the average of each year’s income return over the stated time period without taking compounding into account. 4 Data from 1/1/1998–9/30/2018. Commercial mortgages are represented by the Giliberto-Levy Commercial Mortgage Performance Index. The Giliberto-Levy Commercial Mortgage Performance Index measures the investment performance of select private-market investments in commercial real estate debt. Commercial mortgages may be subject to default risk. Government bonds are represented by the Bloomberg Barclays U.S. Treasury Index. The Bloomberg Barclays U.S. Treasury Index measures U.S. dollar-denominated, fixed-rate, nominal debt issued by the U.S. Treasury. Government bonds may be subject to interest rate risk. Corporate bonds are represented by the ICE BofAML U.S. Corporate Index. The ICE BofAML U.S. Corporate Index tracks the performance of U.S. dollar-denominated investment grade corporate debt publicly issued in the U.S. domestic market. Corporate bonds may be subject to default and interest rate risk. Equity REITs are represented by the FTSE NAREIT All Equity REITs Total Return Index. The FTSE NAREIT All Equity REITs Total Return Index is a free-float adjusted, market capitalization-weighted index of U.S. equity REITs. Equity REITs may be subject to market and interest rate risk. U.S. stocks are represented by the S&P 500 Total Return Index. The S&P 500 Total Return Index is a benchmark of large-cap U.S. equities. The index includes 500 leading companies, captures approximately 80% coverage of available market capitalization and assumes all resulting dividends are automatically reinvested. U.S. stocks may be subject to market risk. U.S loans are represented by the Credit Suisse Leveraged Loan Index. The Credit Suisse Leveraged Loan Index tracks the investable market of the U.S. dollar-denominated leveraged loan market. U.S. loans may be subject to default risk. High yield bonds are represented by the ICE BofAML U.S. High Yield Index. The ICE BofAML U.S. High Yield Index is designed to track the performance of U.S. dollar-denominated below investment grade corporate debt publicly issued in the U.S. domestic market. High yield bonds may be subject to a higher default risk than loans. Each asset class is suitable for specific investor objectives, which vary greatly.